But how fast can the array be rotated “in place”, using only O(1) (constant) additional space? Given two sorted arrays, a and b, how fast can we find the intersection between them? This post complements the previous TSP-related post by analyzing some asymptotic properties of the factorial. This is a conservative result, as the factorial is greater starting from n = 6. In this post we will analyse two exact algorithms to solve the Travelling Salesman Problem: one based on an exhaustive iteration through all the possible tours and another one using dynamic programming to reduce the asymptotic run time. Let’s start with the exhaustive one, as it’s easier. We can number the cities from 0 to n and assume a distance matrix Di,j as given (the matrix doesn’t need to be symmetric, as it can reflect restrictions such as one-way roads). Then the code reduces to enumerating the tours (circular permutations of 0, 1, …, n) and selecting the one who has minimum length. itertools.permutations() is a Python primitive since the 2.6 version, but the internal implementation is explained in this excellent “Word Aligned” blog post. Get the path of minimum length that starts at city 0, passes through the set of cities 1 to n in any order and ends at city 0. Get the path of minimum length that starts at city 0, passes through a set of cities ts (not including i or 0) in any order and ends at city c.
Now that we have a recursive solution, we can add a memoization decorator to avoid recomputing and we get a dynamic programming algorithm. The set was replaced by a Python frozenset, because the function arguments must be “hashable” if the memoization decorator is going to be used. The dynamic programming algorithm performance can be greatly improved by writing it in C, using bit operations to handle the cities’ set and building the partial results table iteratively from the bottom up. But all this techniques can only give us a constant improvement, with the asymptotic complexity remaining the same. 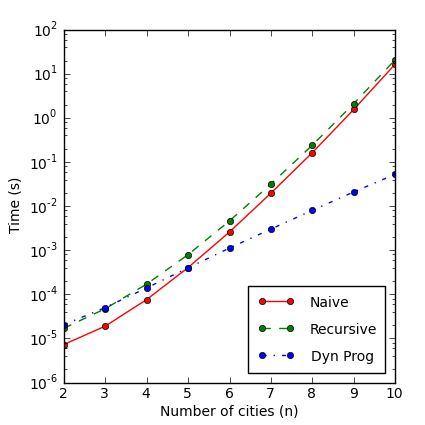 Running times as a function of the number of cities for each of the three algorithms. It can be seen in the plot that the initially slowest algorithm, the one applying dynamic programming, ends up being more than one hundred times faster that the other two. As we are working with a semilog plot, the straight line of the DP algorithm is associated with approximately exponential growth, while the other algorithms show super-exponential growth. Even though mathematical structures that are now called fractals were first analysed in the 19th century, the study of self-similar structures got a significant boost when computers able to visualize them started to appear in the 1970s. In fact, the term fractal was coined in 1975 by the late Benoit Mandelbrot to describe structures whose parts are similar to the whole. We can now inductively explore the hypothesis , with . This implies that will diverge at least geometrically, with ratio . Then any point whose modulus is greater than 2 will be outside the set. It can be seen by a slight extension of this argument that, if there is some such that is greater than 2, will be outside the Mandelbrot set too. The simplest way to plot a Mandelbrot set is to iterate the quadratic polynomial over the points that are associated with an image in the normal way (via some choice of origin and scale factor). If the iterated point reaches a modulus greater than 2 we know that its module will diverge and that it is outside the set. There isn’t any simple test to know if a point is inside the set, but we can choose a fixed number of iterations or to stop the process when no new point outside the set is detected. A "copy" of the Mandelbrot set in a filament. Zoom out in the live version to see its location.